The Spinal Fellowship is sponsored via The Wesley Research Fund. The Fellowship is located jointly between The Wesley Private Hospital in addition to the Princess Alexandra Hospital. The supervisors for the program are Associate Professor Robert Labrom, Dr Simon Gatehouse, Dr John Albietz, Dr Anthony Athanasiov and Dr Ian Cheung. A 6-12 month tenure may be negotiated with an equal distribution amongst supervisors. Training is done via the Princess Alexandra Hospital, The Wesley Hospital, Greenslopes Private Hospital and the Lady Cilento Children’s Hospital. The Princess Alexandra Hospital is located in Annerley in Brisbane and is an 800 bed tertiary referral centre. The Hospital caters for an extensive case load per annum including both acute and chronic spinal adult conditions. The case load would include trauma, infection, neoplasia and degenerative disorders. The Wesley Hospital is located in Auchenflower in Brisbane and is the base for the private practice of the supervisors. The practice is part of a broader group of Orthopaedic Surgeons under the guise of the Queensland Combined Orthopaedic Specialists, called QCOS Spine. Amenities at the practice allow for educational meetings and resources. The Lady Cilento Children’s Hospital is located in Annerley on the Southside of Brisbane and is a tertiary referral paediatric institution catering for spinal deformity on a Queensland wide basis. On call commitments are that the Spinal Fellow provides a 24 hour on-call 1 in 3 roster for spinal disorders at the Princess Alexandra Hospital. The Accident & Emergency Department will notify the Fellow and Orthopaedic Registrar on call for that day about all relevant spinal admissions. The Spinal Fellow and the Registrar for the spinal service attends to these patients. There is a weekly all day operating list at the Princess Alexandra Hospital under consultant supervision and provision for a trauma list on a weekly basis. Out of hours trauma and acute surgery is undertaken on a regular basis under the supervision of the on-call consultant. On-call is for spinal conditions only and not for general trauma. Second Friday meeting is held at The Wesley Private Hospital with the Supervisors to assess educational progress in addition to clinical lecture presentations. Every Wednesday 7.30 – 8.30 am at the Spinal Injuries Unit a clinical meeting at the Princess Alexandra Hospital is undertaken. 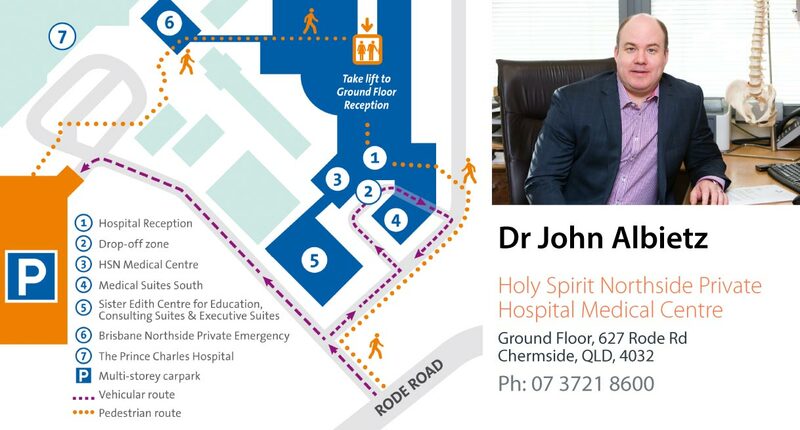 Every other Friday there is a meeting at the Brisbane Private Hospital from 7 am – 8 am. This is a combined meeting. Research may be undertaken as part of the Fellowship position. This may be undertaken at all Hospitals involved with our QCOS Spine Surgeons and their currently run clinical projects. There is dedicated weekly time devoted to ongoing research work. It is the responsibility of each appointed Fellow to complete one research project to the point of acceptance at peer review publication within the 6 or 12 month position. A podium presentation at one National meeting during the Fellowship is expected and anticipated. Royal Australasian College of Surgeons Fellowship or equivalent for Orthopaedic surgery or Neurosurgery. To apply, please provide a cover letter and curriculum vitae including references. Contact details for each supervisor are provided on the website.